Summer is finally here, which means we can all look forward to some fun in the sun! The down side is that the Monday to Friday school routine is out the window. The lack of routine makes it easy to lose track of how much screen time our kids are getting. And this has many parents wondering — how much screen time is too much, and how can we manage it? The Canadian Pediatric Society defines screen time as any time spent on a screen-based device, including television, computers, smart phones, tablets, video games and even wearable technology such as a smart watch. As these screen-based devices are becoming such a central part of our lives, along with emerging technologies such as virtual reality, it is important that we tune in to their potential impact on our kids’ health and development. Access to screen-based devices among children is on the rise. Nearly all kids live in a home with a mobile media device, according to a report by Common Sense Media. And in 2017, 42 per cent of kids (compared to only one per cent in 2011) had their own tablet or smart phone. This same report shows that children under eight years of age spend an average of two hours and 19 minutes each day and children under two spend an average of 42 minutes per day, on screen media. Having a family media plan can help to limit screen time and promote healthy summer activities. When examining daily screen time for older children and teenagers, a 2015 report showed that those aged eight to 12 years are spending more than 4.5 hours per day on a screen-based device, and teenagers between 13 and 18 years of age are spending over 6.5 hours per day on one. While screens can be used to support education with older children, experts are concerned about the impact that excess screen time may have on children’s health and developmental outcomes. Research has shown a strong link between excess screen time and obesity. This could be influenced by the sedentary nature of screen viewing and the tendency to consume less healthy food items while engaging in screen-based activity. There is also research suggesting that excess screen time can negatively impact a child’s cognitive development and attention span, and may even lead to language delays among our youngest populations. Within the adolescent population, research shows a link between excessive screen viewing and antisocial behaviour in early adulthood. Thankfully, there are evidence-based guidelines to support parents in making informed decisions for the health of the whole family. 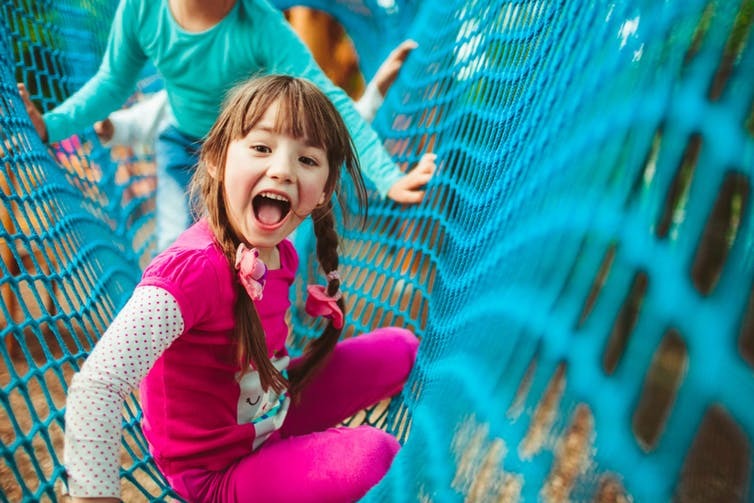 The recently published Canadian 24-Hour Movement Guidelines for the Early Years, and the Canadian 24-hour Movement Guidelines for Children and Youth provide recommendations for recreational screen time. For children less than two years of age, screen time of any amount is not recommended. For children aged two to four years, screen time should be limited to no more than one hour each day. Children aged five to 17 years should limit recreational screen time to a maximum of two hours daily. Bedroom use of electronic devices is displacing sleep and lowering self-esteem among teenagers. It’s helpful to have a family media plan that includes a screen-time limit for each child. Setting limits will help to set children’s expectations. Research has shown that when parents set these limits, there is a significant reduction in their overall screen time. Of course, successful implementation requires consistency over time so children and adolescents develop a clear understanding of screen time rules. Meal time is the perfect time to connect with your children, learn about their day and share stories over food. Unplugging during meal time is helpful. Research shows that children who watch television during meals end up with more screen time overall. A 2011 study showed that TV viewing during dinner was associated with an increase of 69 minutes per day on weekdays and 122 minutes on weekends. Ditching devices while dining has the added bonus of improving dietary patterns. Research shows that children who use screens during meals consume less healthy food options such as fruits and vegetables, and more snack foods and sugar sweetened beverages. For parents, removing your mobile media device from the dinner table shows your family that you are “plugged in” to the conversation. A 2015 study showed that when people brought a cell phone to the table, even when not in use, it resulted in a reduced quality of conversation and undermined the depth of connection. The degree to which parents use their own screen based device is associated with their children’s screen time. Avoiding screen use while engaging with your children is a great way to promote healthy behaviour. Canadian 24-Hour Movement Guidelines for the Early Years. Not only will this modeling help to reduce your children’s and adolescents’ overall screen time, but it prioritizes face-to-face interactions through conversation and active play. It is tempting to use screen time as a means of controlling a child’s behaviour because it tends to result in an immediate response. However, this may cause an unintentional increase in screen use over the long term. An example of this would be providing screen time as a reward for good behaviour or taking it away as a punishment for bad behaviour. This can cause children to put a high value on screen time, and desire more of it. Keep mobile devices and charging stations out of the bedrooms! Teenagers need between eight to 10 hours of sleep each night for proper growth and development, and to recharge themselves for another day. Studies have shown that bedroom use of mobile phones and other devices have been displacing sleep time in the adolescent population. This displacement of sleep time decreases self-esteem and coping skills among our adolescents, and reduces their ability to manage behavioural impulses Keeping devices out of bedrooms improves sleep quality and health among children and adolescents. Parents play a strong role in guiding the media use of their children. Allowing children and teenagers opportunities to explore their natural environment away from screen-based devices promotes active play and creativity, and helps develop healthy behaviours now and in the future.